on using this book because it has everything in it! 42 of 73 people found this review helpful. July 09, 2008 Great wedding music! My sister is getting married in Sept. 2008 and this book was perfect for her to pick what she needed for the ceremony! 38 of 81 people found this review helpful. A useable collection with interesting arrangements. 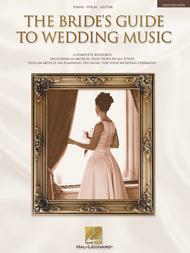 This book could be easily used to present musical possibilities for a wedding service. It contains examples from most musical venues for piano starting with Baroque to today. If you need one book with almost every requested wedding song - from classical to pop - this is the book. Very good arrangements for an experienced musician. 36 of 77 people found this review helpful. April 06, 2008 Great collection! This is an outstanding collection of music for weddings - everything from traditional classic pieces to pop standards that I use all the time. Most of the pop standards are the original artist arrangements. Highly recommended! 47 of 76 people found this review helpful.